Holstein champion Desmond Dundee Embrace, owned jointly by the Jones family, Co Wexford, which runs the Hallow Holstein herd, and Roy Cromie, Donegal, claimed the Royal Ulster Winter Fair inter-breed championship. Imported as an embryo from Canada by Limerick Holstein breeder Martin O’Sullivan, the fifth-calver is no stranger to success at Balmoral, having won the same title at the Winter Fair two years ago. Its daughter, by Doorman, sold for 5,500gns at a Carlisle sale in February this year and it has been flushed a number of times. Judge Paul Trapp, Wisconsin, described his champion as an elite cow. The inter-breed reserve and reserve Holstein champion was Evergreen Duplex Ebony, owned and bred by Liam Murphy, Co Carlow, which had previously won the inter-breed title at last year’s Winter Fair. Having calved for the fifth time in June, it is currently giving 38kg per day and is back in-calf to Evergreen Aladdin. Mr Trapp selected the Ayrshire champion Sandyford Honest Blizzard as his honourable mention. This was a 12th breed title at the winter fair since 1988 for Co Antrim breeders John Hunter and his son Michael. The Hunters have been milking Ayrshires since 1965. Blizzard, which calved for the third time a few days ago, was bred by the Tomlinson family from Loughborough, Leicestershire, and was bought for 3,600gns at their reduction sale in September. The Hunters also had the Ayrshire reserve, Ardmore Janet 110, a home-bred second-calver being shown for the first time. 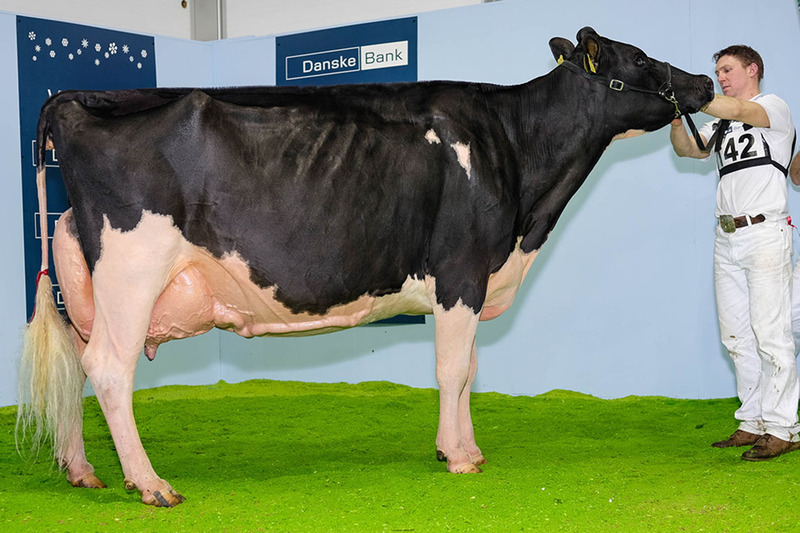 Clandeboye Estates, Bangor, won the Jersey breed title with the home-bred second-calver Clandeboye Allstar 1 Evita, which had calved for a second time a fortnight before the event. Reserve Jersey went to Co Cavan breeder Seamus Shannon with his third-calver Thurlstone May Fay, bred by John and Susan Dickinson, South Yorkshire. Mr Shannon said: “I bought her in early 2015 when she was in mid-lactation. It is only now I am seeing her in full milk. She has grown into a tremendous cow. Two different branches of the Booth family, south Co Tyrone, took home the main Dairy Shorthorn prizes. Father and son George and Jason won the breed championship with their heifer in-milk Beechview Empire Tiny, which had previously won the Winter Fair Shorthorn junior championship as a seven-month old calf. Shorthorn reserve went to Noel and Ralph Booth with their second-calver, Kilsally Jill 17. Inter-breed, Supreme, Jones and Cromie, Desmond Dundee Embrace (Holstein); reserve, L. Murphy, Evergreen Duplex Ebony (Holstein). Holstein, Sup., Jones and Cromie, Desmond Dundee Embrace; res., L. Murphy, Evergreen Duplex Ebony. Ayrshire, Sup., J. Hunter, Sandyford Honest Blizzard; res., J. Hunter, Ardmore Janet 110. Jersey, Sup., Clandeboye Estates, Clandeboye Allstar 1 Evita; res., Thurlstone May Fay. Dairy Shorthorn, Sup., G. and J. Booth, Beechview Empire Tiny; res., N. and R. Booth, Kilsally Jill 17. 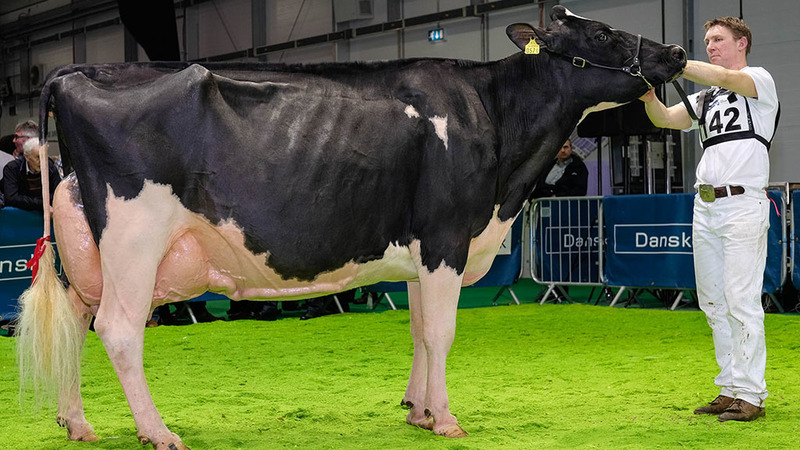 Reserve supreme inter-breed was the reserve Holstein champion, Evergreen Duplex Ebony.